* Annual estimated passenger usage based on sales of tickets in stated financial year(s) which end or originate at Goring & Streatley from Office of Rail and Road statistics. Methodology may vary year on year. Goring & Streatley railway station is a railway station on the Great Western Main Line serving the twin villages of Goring-on-Thames, Oxfordshire and Streatley, Berkshire in England. The station is served by local services operated by Great Western Railway (GWR). The station is on the original line of the Great Western Railway, which opened on 1 June 1840. Originally named Goring, it was renamed Goring & Streatley on 9 November 1895 to prevent confusion with Goring-By-Sea. 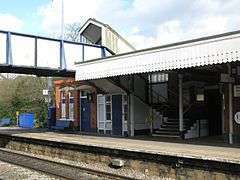 The station is in the village of Goring-on-Thames, some five minutes walk from Goring and Streatley Bridge which connects the village with the Berkshire village of Streatley, across the River Thames. The station is adjacent to and to the east of the village centre. The station has two side platforms (platform 1 on the up fast line and platform 4 on the down relief line) and a central island platform with two faces (platform 2 on the down fast line and platform 3 on the up relief line. Platforms 1 and 2 are only used when engineering works cause stopping trains to use the fast tracks, and the platform edges are closed off by fences incorporating normally closed and locked gates. The station frontage building is to the east of the station, alongside platform 4 and on the opposite side to the village centre, and there is a large car park to the south of the station building. There are also two pedestrian entrances onto platform 1, one of which links directly to Goring village centre. Access between the platforms is via a footbridge, accessed by steps and lifts. Goring & Streatley station is served by stopping services run by GWR between Reading and Oxford. The typical off-peak service from the station is two trains per hour in each direction. Most of these services start or continue as semi-fast services between Reading and London Paddington, there are also additional services during morning peak hours on weekdays and some northbound trains are extended to Banbury. Saturday services run half-hourly, but Sunday services are only hourly. Typical journey times are about 15 minutes to Reading, 20 minutes to Oxford, and just over an hour to Paddington. In 2008 only 74.9% of trains ran on time on GWR's Thames Valley route serving Goring & Streatley station, with peak period reliability especially badly affected. Preparation for the electrification of the line between Paddington and Bristol/Oxford resulted in the footbridge being replaced and following a strong local campaign led by the mobility group MIGGS (Mobility Issues Group for Goring and Streatley) Network Rail added lifts to each platform to the new footbridge, which was opened in June 2016. These changes also resulted in the demolition of the old ladies waiting room and toilet block on the island platform. ↑ MacDermot, E.T. (1927). "Chapter IV Construction". History of the Great Western Railway. 1 (1st ed.). Paddington: Great Western Railway. p. 102. ↑ Mitchell, Vic; Smith, Keith (March 2002). "Figure 53". Reading to Didcot. Western Main Lines. Midhurst: Middleton Press. ISBN 1-901706-79-6. Wikimedia Commons has media related to Goring and Streatley railway station.